بني في 1998, فندق إيبس ميلبورن، شارع ذا ليتل بورك هو ميزة مُضافة لـ ملبورن و خيار ذكي للمسافرين. يقع مركز المدينة المثير على بعد 1 km فقط. بالنسبة لمن يريد الخروج، هذه بعض المعالم السياحية المتوفرة للزوار ‪St. Augustine Church‬, Spencer Outlet Centre, ‪Water Tower Clock‬. كما يقدم فندق إيبس ميلبورن، شارع ذا ليتل بورك الكثير من الخدمات لإغناء رحلتك في ملبورن. هذه بعض الخدمات الموجودة في هذا الفندق: خدمة التنظيف يوميًا, فاكس, خدمة غسيل ذاتية, آلة تصوير, طابعة. تعكس غرف الفندق البالغ عددها 121 المنتشرة في 10 طوابق جواً من الدفء والألفة.خدمات عصرية مثل تلفزيون بشاشة مسطحة, اتصال لاسلكي بالإنترنت, غرف لغير المدخنين, مكيف هواء, تدفئة موجودة في بعض الغرف المختارة. يمكنك طلب اللائحة الكاملة للخدمات في الفندق ومن بينها مركز للياقة البدنية. مهما كانت دواعي سفرك فإن فندق إيبس ميلبورن، شارع ذا ليتل بورك هو خيار ممتاز لإقامتك في ملبورن. 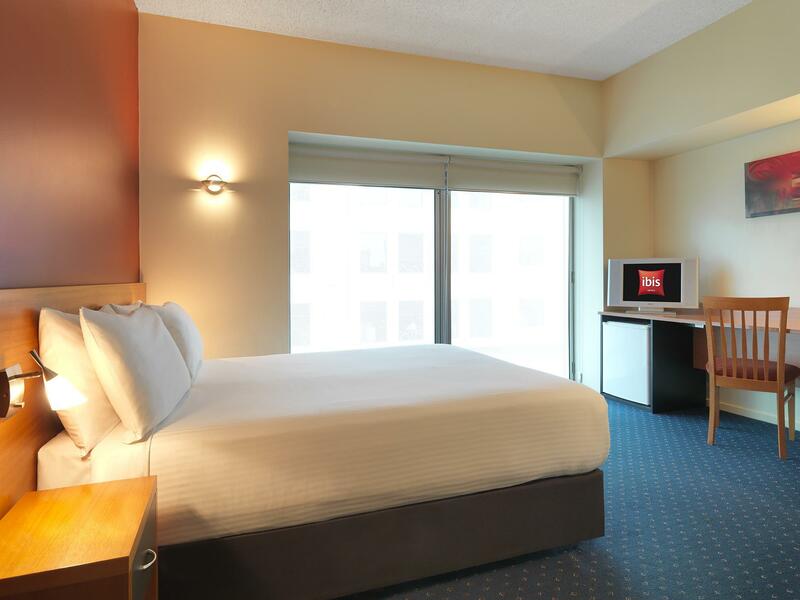 Great location, two minute walk from skybus terminal, staff were very pleasant and helpful. The room was small with no frills (basic facilities), but we weren't after anything more. The beds were comfortable and whilst the bathroom was small, it was sufficient for our needs. It was clean, tidy, secure, quiet and with a decent view. The only con was the outdated tv which could probably do with updating. We will be coming here again. The hotel is near to Southen-Cross Station. Location is good. Wifi did not work well. I booked two rooms. In one room, it worked well. In the other room, one password was for 2 devices for 2 hours only. We only figured this out in the early morning when checking out. Have conveyed this to the front desk already. In lobby, wifi was offered for two hours with one password. It was weird especially when other counterparts offer free wifi. Got it at a promo price so the price ended up being acceptable for the quality of the hotel. It is a hotel at an excellent location with basic, clean facilities that you need, simply no fuss. But the room was small and has no view that it looks just like a square with 4 walls - so I will not be paying anything beyond the promo despite it's good location. Our stay was enjoyable. Staff were courteous and helpful. My room was ready upon arrival and was exceptionally clean and roomy. The location was a short walk to the railway station and etihad stadium. There was a need to evacuate our room over night but I found the fire alarm easily heard and woke us from our sleep. An announcement may have helped also as some other customers seemed confused. The hotel was fairly modern and the rooms were an average size. they were perfect for getting the rest required and contained all the features you would expect. The staff were friendly and the knock knock cafe on the corner had an amazing menu with funky décor making it the first stop every morning before exploring Melbourne City. Not a flash up market hotel but convenient to all city transport and not a hard walk to anywhere in the city centre. Chosen because a short walk from the airport bus drop off. Clean, tidy, comfortable and would return again. Location is very good, near trams and southern cross train station, shops and eateries.